Corner Cottage01263 715779work01603 870304fax Self-cateringQuietly located in tranquil countryside Corner Cottage is a delightful holiday cottage beaming with character. The recently renovated accommodation has been cleverly thought out and blends original features with the comforts of modern day life. With a master bedroom and bathroom on the ground floor, together with a double bedroom and twin room on the first floor, this property is perfect for families of mixed generations. The enclosed pretty garden comes complete with barbecue so you can take advantage of dining outside in the summer months, and there is a wood burner in the lounge so you can curl up and watch a family film in the colder months, this really is a property for all seasons. If you are new to this area you are in for a treat, there is plenty to explore - Conveniently located close to the Norfolk Broads you can easily spend a day or two taking in the stunning scenery by boat or land. Hickling Broad and Barton Broad are the nearest, Hickling Broad is rich with wildlife - Kingfishers, Herons and Otters are often spotted along the watersedge. Barton Broad is where Horatio Nelson learned to sail as a boy, and, if you would like to make a visit, the Museum of the Broads in Stalham runs trips in a traditional Victorian steam boat, to the broad in during their opening season. The sandy beaches of the east coast are vast and rather quieter during the summer season from that of the beaches of the north. That said Grey Seals make this their area of choice and are often spotted just off of the shoreline along this part of the coast. If you have history lovers in your family do be sure to visit Norwich to take in the sights, visit the museums and walk in through the lanes which are host to a mix of architecture from Tudor to modern day. • Other: Towels. Travel cot, Books and games provided. • Outdoors: Pretty enclosed rear garden with decking. Table and chairs. Barbecue and fire pit. 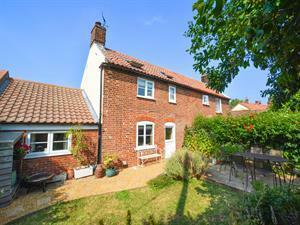 Quietly located in tranquil countryside Corner Cottage is a delightful holiday cottage beaming with character. The recently renovated accommodation has been cleverly thought out and blends original features with the comforts of modern day life. With a master bedroom and bathroom on the ground floor, together with a double bedroom and twin room on the first floor, this property is perfect for families of mixed generations. The enclosed pretty garden comes complete with barbecue so you can take advantage of dining outside in the summer months, and there is a wood burner in the lounge so you can curl up and watch a family film in the colder months, this really is a property for all seasons. If you are new to this area you are in for a treat, there is plenty to explore - Conveniently located close to the Norfolk Broads you can easily spend a day or two taking in the stunning scenery by boat or land. Hickling Broad and Barton Broad are the nearest, Hickling Broad is rich with wildlife - Kingfishers, Herons and Otters are often spotted along the watersedge. Barton Broad is where Horatio Nelson learned to sail as a boy, and, if you would like to make a visit, the Museum of the Broads in Stalham runs trips in a traditional Victorian steam boat, to the broad in during their opening season. The sandy beaches of the east coast are vast and rather quieter during the summer season from that of the beaches of the north. That said Grey Seals make this their area of choice and are often spotted just off of the shoreline along this part of the coast. If you have history lovers in your family do be sure to visit Norwich to take in the sights, visit the museums and walk in through the lanes which are host to a mix of architecture from Tudor to modern day.